The 9.7-inch iPad Pro is a powerful and excellent tablet. If you are willing to keep its aluminum body and precious display intact for long, you should consider buying the best 9.7-inch iPad Pro cases available on the market. 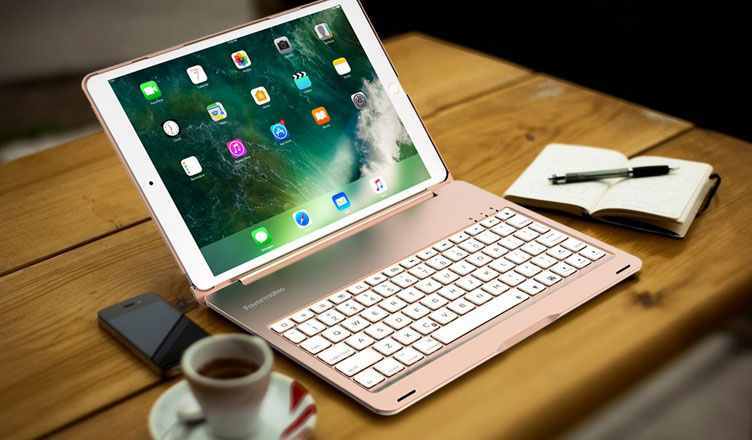 This list of top rated cases for iPad Pro 9.7-inch we have covered different type protective cases like folio case, keyboard case, flip case, leather case, kickstand case, rugged case, etc. These cases are minimalistic in design and thus, do not add any bulk to it. Whether it is an accidental fall on the floor or an unwanted water spill, these cases always keep your 9.7-inch iPad Pro protected. Plunge into this list of cool 9.7-inch iPad Pro to grab the one that suits your needs. Featuring a unique design, this case is a perfect fit for your iPad Pro. With a magnetic case closure, it ensures complete safety of your device when not in use. Also, it supports auto sleep/wake functionalities. With 7 different viewing angles, you can enjoy working on it the way you want. Its PC shell protects it even if it falls from a height of 5 feet. It is designed for the premium quality of the material. As compared to others, it is much expensive. You can now flaunt your 9.7-inch iPad Pro with the exclusive case from New Trent. Its design is such that your iPad Pro stays protected. Moreover, it adds style and function to it. You can enjoy viewing your favourite content while keeping your hands totally free with the help of kickstand. The leather strap enables you to carry it conveniently wherever you go. The screen protector safeguards your iPad Pro’s screen from nicks. It is costly as compared to other cases. Provide ultimate protection to your new 9.7-inch iPad Pro with the heavy duty case from YOUMAKER. Designed to be shockproof and shock resistant, it safeguards your iPad Pro from unwanted external shocks. The TPU bumper protects your iPad Pro from drops and bumps. The responsive buttons provide you with crisp feedback when pressed. The elevated edges ensure the protection of the screen. There are limited colour options available. Spigen is one of the most reputed companies manufacturing the best 9.7-inch iPad Pro cases. Designed with dual layer technology, it ensures durability and shock absorbency. Thus, you can be free from all the worries of getting it damaged. It is simple yet delivers a decent protection to your iPad Pro. Its raised edges prevent your iPad’s screen from scratches when you place upside down on even or flat surfaces. If you want to work for long on your iPad Pro and wish to attach a keyboard while maintaining its safety at the same time, here is a case for you. This keyboard case perfectly wraps around the contours of your 9.7-inch iPad Pro. Your iPad Pro automatically wakes on opening the case and sleep when closed. Thus, it saves the battery. Its aluminium structure prevents your 9.7-inch iPad Pro from scratches, cuts, and scrapes. Its backlit functionality provides you with the convenience of working at night. It is expensive in comparison to other cases. This heavy duty is specifically designed to fit your 9.7-inch iPad Pro. The exact cutouts for the ports, buttons, and camera enable you to access all the functionalities of your iPad Pro instantly. The hand strap provides you with the convenience to carry it wherever you want without any hassles. You can chat with your friends while resting your iPad Pro on the kickstand. With the provided belt, you can even hang it in your kitchen or other places. It may add bulk to your 9.7-inch iPad Pro. Designed from premium quality of PU leather and featuring a soft microfiber lining, this case from ToGeeKa ensures the safety of your 9.7-inch iPad Pro all the time. It prevents your iPad from scratches and other wear and tear use. With multiple pockets integrated into it, you can store your cards, cash, and some of the other accessories in it. You can adjust your iPad Pro in 3 different angles to have a comfortable viewing experience. It offers full protection to all the four corners. It might add a little bulk to your iPad Pro. Available in a pool of striking colours and ample amount of designs, this case from Fintie is the best one to have for your 9.7-inch iPad Pro if you love to keep changing your case as per your mood and style. Built from durable leather, this case snugly fits the contours of your 9.7-inch iPad Pro. The magnetic strap ensures a safe and secure closure. You can also access all the ports easily. You might get different shades of colour than the ones shown in the picture. If you are a lover of leather case, then the one from DTTO is an ideal one to buy. Featuring excellent workmanship and soft microfiber lining, it delivers superior look and protection for your iPad Pro 9.7 inch. You can store your debit/credit cards and other ID cards in the provided card pocket. With multiple slots, you can adjust the viewing angle as per your wish. You get full access to all the ports, buttons, speakers, and camera. You get very few colour options. The back smart cover from ProCase is specifically designed to fit your 9.7-inch iPad Pro. It is light in weight and hence, does not add any bulk to it. Further, it also protects it to the fullest from accidental damages. It is available in a pool of striking colours. The magnetic closure keeps the iPad Pro safe. You can even use this closure as a stand to operate your iPad in horizontal mode. It adds minimal bulk to your iPad Pro. It may cause troubles in case you want to remove it. Available in many different colours, you can pick up the one that goes with your iPad’s design and your style. Also, it is available at an affordable price. So, you can buy one or more and change them as per your mood or clothing. The magnetic closure offers auto-sleep and auto-wake functionalities. You can tri-fold the case so that you can enjoy working on it in either mode. The material is such that it prevents your iPad from scratches and scrapes. The stand might slip under certain circumstances. Love to keep it funky? The 9.7-inch iPad Pro case from Dake might draw your attention. Its three-layered design ensures its safety from all kind of unwanted and unexpected damages. With the in-built kickstand, you can watch videos, movies, or pictures while keeping your hands absolutely free. It features a PC cover and a bumper to offer full body protection. Hence, your iPad Pro stays protected. It does not come with a screen protector. MoKo is again a well-known brand providing the best quality of 9.7-inch iPad Pro cases. This leather folio case is specifically designed to fit your 9.7-inch iPad Pro. the precise cutouts for the ports, buttons, camera, and speakers keep your device functional even in the case. The PU leather exterior and soft interior make it perfect for everyday use. You can store your accessories such as cards, pen drives, cash, cables, and more in the side pocket. The in-built Apple Pencil loop lets you place it safely if you have one. This case has just 2 colour options for you. Which case you are going to order from this list for your iPad Pro 9.7? Do write to us about your choices in the comments section.